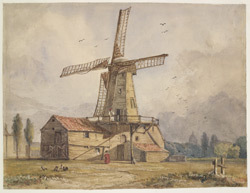 This gentle watercolour depicts an old 'smock' mill in Surrey. The name given to this type of windmill refers to its shape resembling the workmens' clothing of the time. There are only a few of these timber mills remaining today, found scattered across the county. Surrey possesses Britain's oldest working mill, built in 1665 by Thomas Budgen, miller of Nutfield.